The PIR MOTION DETECTOR HIDDEN CAMERA with built-in DVR is the best on the market. It doesn't just look like an alarm system's motion detector but functions as one too! 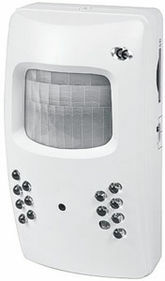 It has an alarm output so you can connect it right to your alarm system, and use it as an alarm sensor as well as a hidden camera. • Overwriting when memory is full.